Population growth often leads to property price growth. 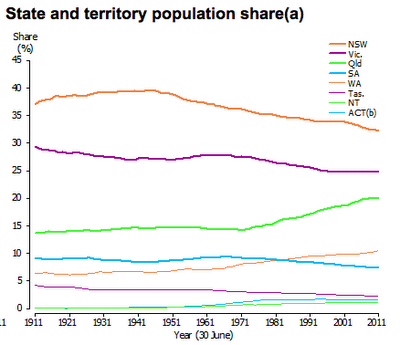 Statistics from the 2011 census were released recently, and show the population growth for Queensland. The question is whether this growth will continue, and at what rate. The official population estimates show that Australia's population was a little under 4.5 million people in 1911 and by 2011 there were 22.3 million people. The Commonwealth Censuses have also tracked the growth and development of the states and territories that make up the Commonwealth of Australia, as well as recording the distribution of the population between them. 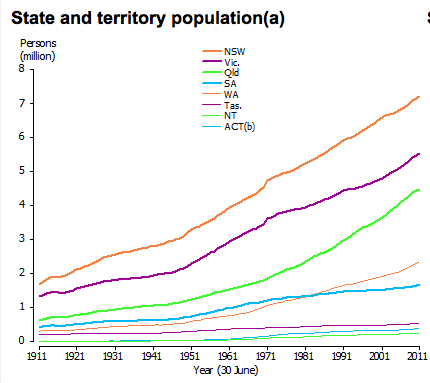 In the 100 years between 1911 and 2011, population growth for the two most populous states, New South Wales and Victoria, has largely tracked that of the national population. 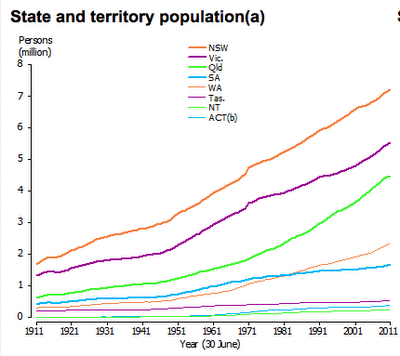 Both Western Australia and Queensland had relatively consistent shares of the national population until the 1960s and 1970s, when substantial expansion of the economies in both states began to occur, supported at least in part by mining development. Since 1911, Queensland's share of the national population has grown by 6.3 percentage points, while the population share for Western Australia grew by 4.1 percentage points.